6 months ago I didn’t care much for running. I didn’t like it, but that’s as strong as the emotions got. And now this week has happened. A week that started with me tuning in to hear how the Boston Marathon was going (something I’d have never considered doing 6 months ago), and then turning on the TV to see the bombs exploding by the finish line. What the hell was that all about? These are people running for charity, for personal goal, for achievement, and in many cases in memory of someone that’s died. I watched the telly until late in the evening to hear what was going on. And then I thought – am I right to be one of the millions tuning in to hear what’s happened with the 2 bombs in Boston, when 20 bombs probably went off in the same day in the Middle East? Why don’t they deserve my attention and concern? Should I therefore ignore what’s happened in Boston because I’m not being fair to the Middle East? I don’t think so. I don’t think it’s wrong to be moved or concerned about something because I identify with it more than something else. The bomb went off when there was 4:09 on the clock at the finish line. I was due to be running London the week after, hoping to scrape in just under 4 hours. It would have taken me 10 minutes to cross the start line, so this is pretty much exactly when I’d be hoping to cross the line. Had I been running that marathon, after the months of training, battling with injury, I’d have been massively overjoyed to be crossing the line then. 3 people died. Hundreds were injured. Not just lacerations, but limbs blown off. What complete and utter bastards to ruin the hopes and dreams of everyone affected. I’m writing this the following Saturday. Since then, the two bombers have been identified, and now one is dead and the other captured. This morning I ran Gunnersbury parkrun. I wore a black ribbon on my top to show my respect, and I thought about Boston before the run started. And then I turned my attention back to my own race. 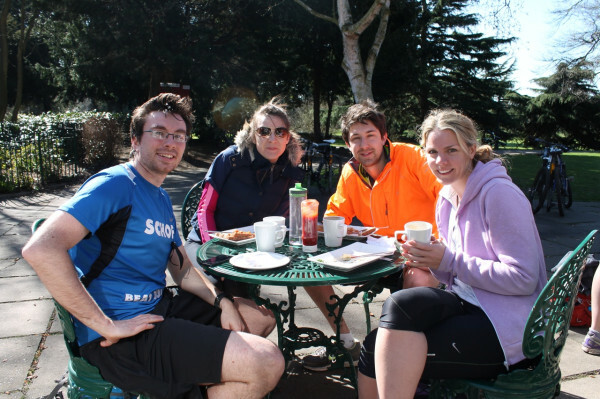 It was just my weekly parkrun, but it was important to me. A few of my friends also came along to run, which was great as what makes parkrun for me is the social side of it. Gunnersbury is my second home for parkruns, so I volunteer whenever possible, and today I’d helped with the setup. It’s also a significant PB spot for me. It was home to my very first sub-24 minute time and my only ever sub-23 minute PB. Could today be the first sub 22? I’m thinking I’ve got a way to go before I suddenly take another 30 seconds off my current PB of 22:25. As is always the case with parkrun, the start was an understated “3, 2, 1, GO” and we were off. I set my watch to pace me at 7:05 minutes per mile – not that I’d keep up with it, but so I could get a feel for how far away I was from breaking 22 minutes. The first part of Gunnersbury is downhill, so i tried to go slightly ahead of pace until the bottom and then kept up as much momentum as I could along the flat and eased off as I turned up the hill. I did the first mile in 6:58 – faster than I needed to go for 22 minutes, but also faster than I could maintain. The second mile saw me complete the lap of the large park and returning to the start point in 7:25 – so I was two thirds of the way into the race and about 13 seconds slower than I’d need to be to break 22 minutes. The final mile was tough. I just tried to keep my pace as much as possible, but saving enough energy to get me to the end. 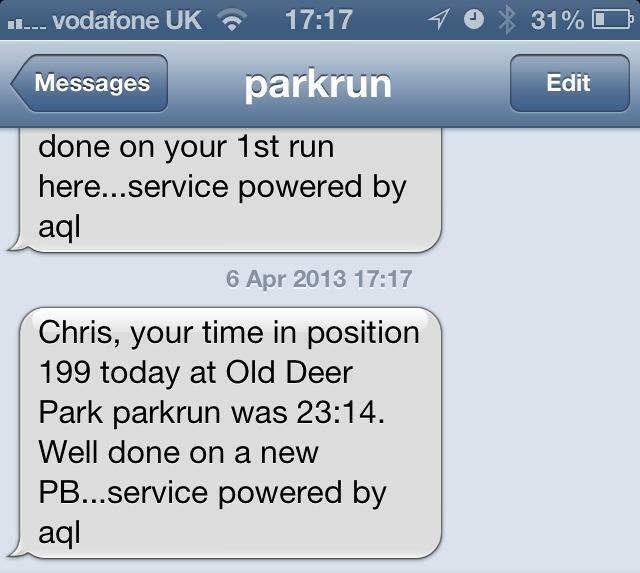 If I did that, I was in with a chance of beating my PB of 22:25. As I approached the last 300 metres, the course went up the final hill. I was running alongside 2 others, and while we each jostled for position, we were all knackered and none of us had the energy to break away. It was all I could do to hold on and get to the finish. It was 21:0-something. I knew if I kept my pace I was in with a good chance of coming in slightly under my PB, but somewhere – I really have no idea where from – but somewhere I found some energy. It was simple really – I found that if I moved my legs quicker I ran quicker. I just tried to run faster and faster. It didn’t matter that it wasn’t possible to maintain and I’d very soon collapse, just as long as I only collapsed after the finish line. I apologised as I passed about 6 people on the finishing straight. It wasn’t their fault I was overtaking them, and I certainly didn’t feel any entitlement to pass them – it felt like I was cheating because I just pretended I could run without limits. In fact, in the last 150 metres I ran at what to me seems like a super human pace – 4:51 per mile. Christ on a bike! I’ve never gone under 6 minutes per mile! And then I crossed the line. I fumbled for the stop button on my Garmin, and eventually found it. It seemed important to stop my watch, but not as important as getting onto all fours and gasping for breath. Somehow I had to repay the massive third-world-sized debt my body had taken on, and dearly hoped God would just write it off. It was a good minute later before I thought to look at my watch. 21:54. I’d done it. I’ve no idea how, but I’d done it. The shear elation at breaking the 22 minute barrier was indescribable. Unlike my previous PB, I sit here fairly convinced this is a PB I will not beat in a long time. So now it’s Saturday evening. Tomorrow is the 2013 London Marathon. The race I have a place in. The one where I felt I could finally do myself justice with a decent time. The race my training was going so well for before I got injured. The race I finally withdrew from yesterday. To everyone running in tomorrow’s marathon – a massive good luck to you – it’s the training and dedication that you’ve put in over the last 4+ months that will see you through something that less than 0.1% of the world’s population have managed. You deserve to be there. Don’t let the mindless acts at last week’s Boston marathon put you off. Think about them during the 30 seconds silence before the start of the race, and then focus everything you have on your race, because the rest is down to you.